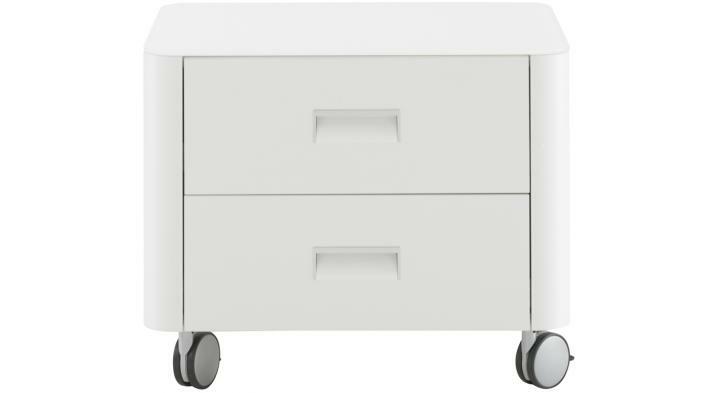 Companion bed: frame in panels of white laminated particleboard (ribbed on the exterior), equipped with 4 lockable castors. Intended to take a slatted base and Bultex mattress H 6 1/4''. Lower section can take either a storage drawer (internal height 6 3/4'') or an occasional bed with slatted base, which takes a specially adapted Bultex mattress 34 1/2'' x 73 1/2'' x 3 1/2. When pulled out, this occasional bed rises to the same height as the main bed, thanks to its automatically-unfolding feet. H 75" x W 44" x D 25"
Chest finished in ribbed laminate (horizontal ridges). 2 1/4" thick side panels are rounded to the front and rear. 1/4" thick top and interior are matched to chest. Inset handle in zamac, with central section matched to chest. 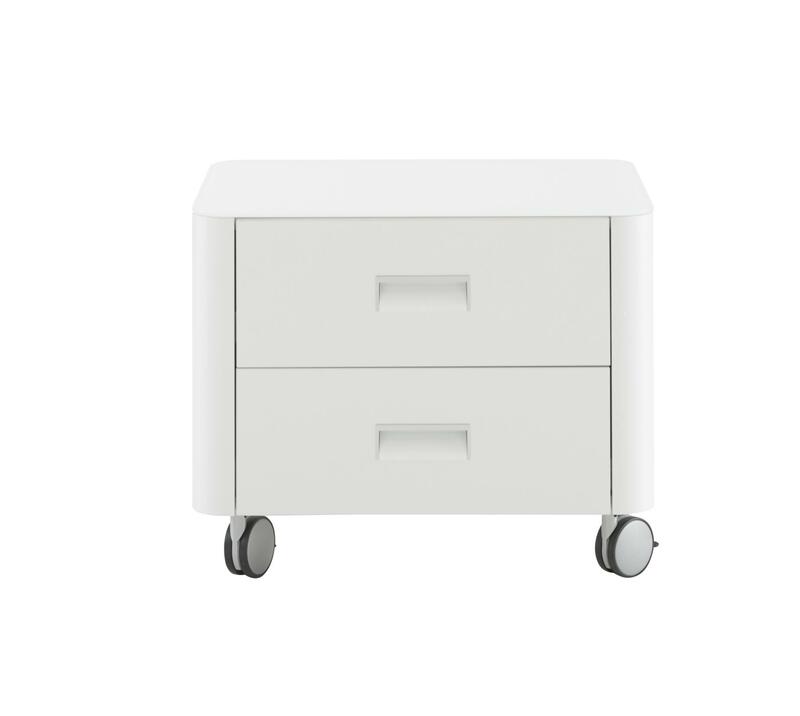 Equipped with castors (with brakes at front). Interior fittings: 1/3 shelving on left; 2/3 hanging rail in top section and shelf in bottom section on right. For ease of transportation this item is delivered in pieces for assembly on-site. H 19" x W 38" x L 84"
Bed comprising frame in panels of particleboard clad in ribbed laminate. Top of 1/4" thick side panels is smooth. Mounted on 4 lockable castors. Intended to take a slatted base and Bultex mattress (recommended thickness 6 1/4"). Lower section can take an occasional bed with slatted base, which takes a Bultex mattress (34 1/2" x 78" x 3 1/2"); when pulled out, the latter rises to the same height as the main bed, thanks to feet which unfold automatically. IMPORTANT: BEDDING (SLATTED BASE + BULTEX MATTRESS MUST BE ORDERED SEPARATELY). 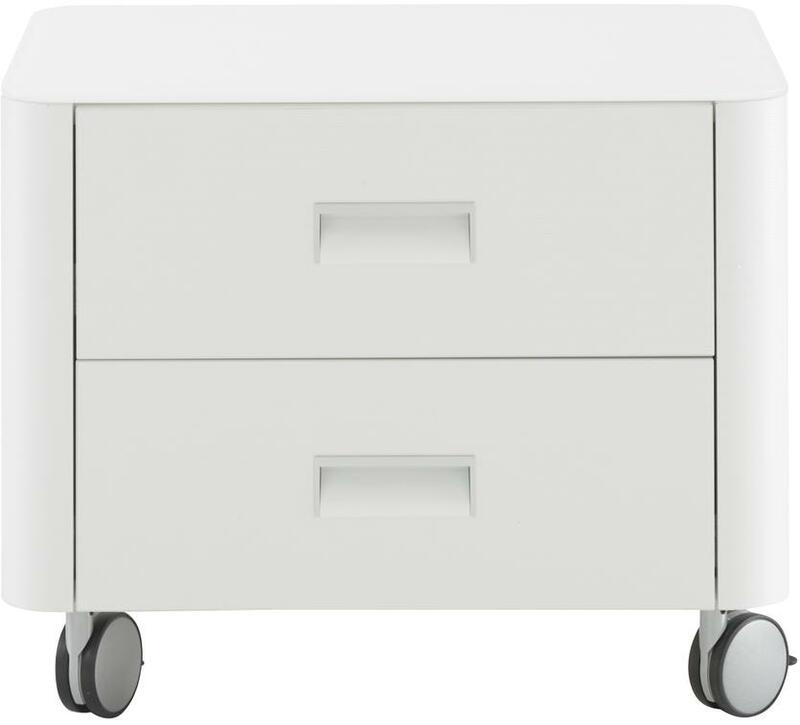 H 19" x W 50" x L 84"
H 12" x W 38" x L 84"
Drawer W 35 1/2" on castors, internal height 6 3/4". May be used with either width (35 1/2" or 47 1/4") of companion bed. This bed may be used with either width (35 1/2" or 47 1/4") of companion bed. 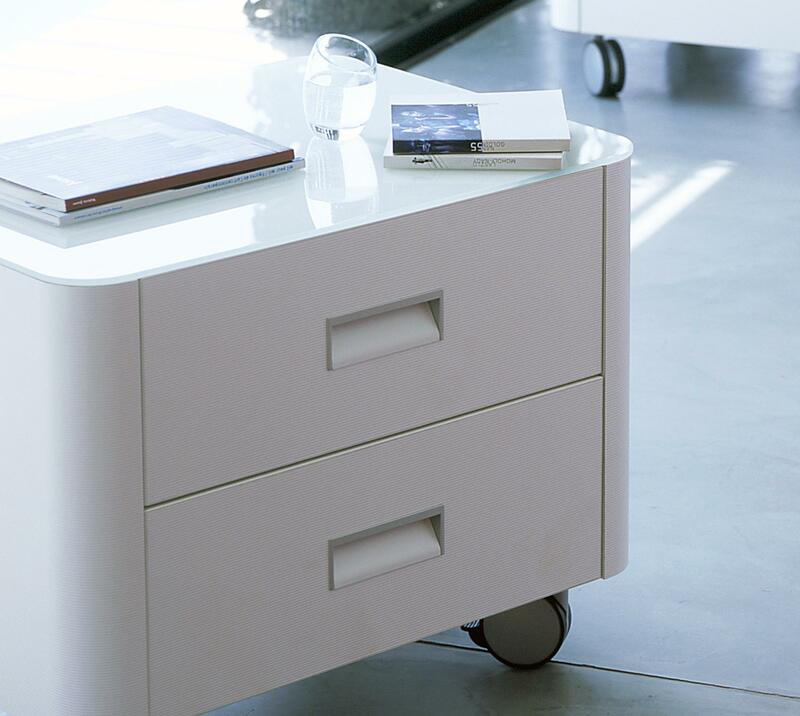 When pulled out, it rises to the same height as the main bed, thanks to feet which unfold automatically. Equipped with a slatted base, which takes a special Bultex mattress (34 1/2" x 78" x 3 1/2"). IMPORTANT: MATTRESS MUST BE ORDERED SEPARATELY). H 20" x W 25" x D 19"
Chest in particleboard finished in laminate with horizontal ribbing. The 2 1/4" thick sides are rounded both front and back; top in 1/4" thick glass. Interior matched to chest. Inset handles in zamac with central part also matched to the chest. Fitted with castors, with brake at front.